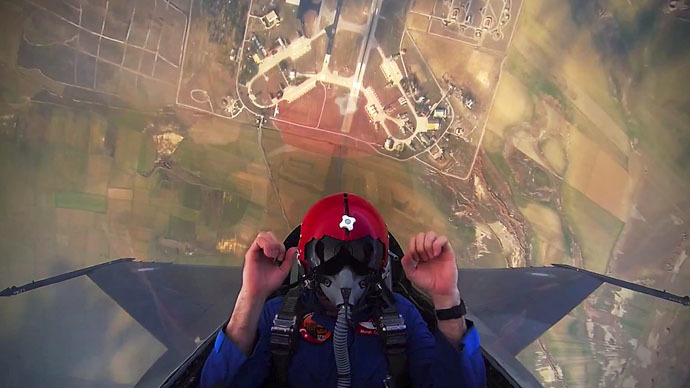 A cockpit-view GoPro video shot by Turkish test pilot shows an F-16 fighter jet gaining well over 4km in altitude in a matter of 45 seconds from the moment it starts rolling on the airfield, with the actual flight time to get there less than 20 seconds. The F-16 B Fighting Falcon steered by Turkish TAI Test Pilot Murat Keles and rear-seat pilot Murat Ozpala simply shoots upward vertically above the clouds with such a speed that viewers physically feels the immense Gs the pilots feel while speeding up the skies and sending the jet’s engines to full throttle. It takes nearly half a minute for the F-16 to gain speed on the airfield and in a matter of seconds the same airfield looks toy-like somewhere far beneath. Keles is known in Turkey as the very first solo Turk pilot of the Turkish Air Force’s solo aerobatics display team. And this is how the takeoff looks like from the cockpit of a Mig-29, Soviet combat fighter-jet developed about the same time as the F-16. The Polish Air Force MiG-29 flown by Pilot Captain Adrian Rojek is doing stunts at the Fairford Airshow in 2013. The MiG-29’s rate of climb is even faster than the F-16’s, at 330 m/s against 254 m/s.